Tyresoles - re-treaded tyres, Henry Simon Limited. Homepage. This page: A letter from the 1930s following the inspection of a failed re-mold tyre. The head offices for Henry Simon Ltd were situated on Birdhall Lane in Cheadle Heath, a few miles away from Stockport (then) in Cheshire. I remember the building myself, having grown up only a few miles away. This letter from the late 1930s also advises that they had offices and works in London W3, which I think is where this letter on factory-headed paper was issued from, in September 1936. Henry Simon Ltd could traces its roots back to the 1870s, when its founder put his all-new roller milling machinery into production, revolutionising the industry in a short space of time. The move into the new Cheadle Heath premises took place in 1926, bringing together offices and production facilities onto a single site. The company continued to expand their range of milling machinery throughout the 1920s and 1930s. Associated with the company was another concern - Tyresoles Limited - which was in the re-treaded tyre business (and in fact the name lives on, now based in India). While re-treaded tyres are more often seen on commercial vehicles today, for decades they were also a common choice for motorists on a budget, and to be fair on cars with leisurely performance and driven in a sedate, un-demanding, manner, they were usually up to the job being asked of them. 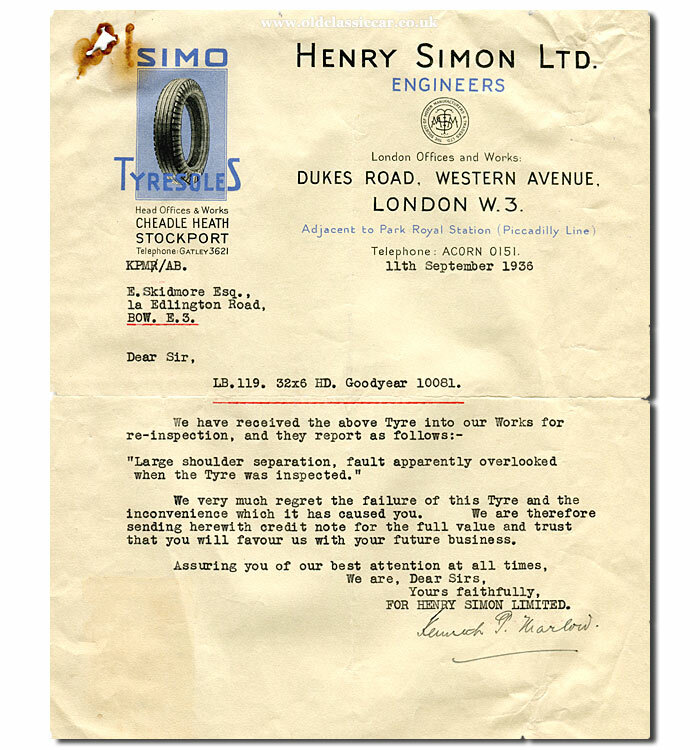 The following letter, typed on September 11th 1936 and signed by company representative Kenneth P. Marlow, refers to tests undertaken on a re-treaded Goodyear tyre. Clearly, a Mr E. Skidmore (an unfortunate name, given the subject!) of Edlington Road in London, had experienced a tyre failure with his 32x6 HD Goodyear tyre. A 32x6, or as they're more often referred to now 650 x 20, was presumably fitted to a commercial vehicle of some kind, HD for Heavy Duty. Most likely it was a Ford lorry, quite possibly a Model BB. The reason I suspect this is that items of paperwork relating to the same gentleman already feature on OCC, in the form of invoices issued to him by a Ford garage, also in 1936. These can be seen on the W.J. Reynolds Ford page. Clearly a tyre on his lorry had given way, with the outer casing that forms the re-tread having separated from the inner casing of the tyre. Whether Mr Skidmore took up the invitation to pass future business in Tyresoles' direction isn't known.